I noticed that several of the Religious Education/Exploration classes in my programs were struggling with following a consistent schedule of components from week-to-week. I suspected that having such a framework might help the attendees and facilitators alike know what to expect each session. I also know that for some of us, knowing the meta-schedule helps to reduce our anxiety and thus allows us to more fully participate in the learning session. To address both these needs I created a visual schedule to put in each of our Religious Education/Exploration program’s class spaces. 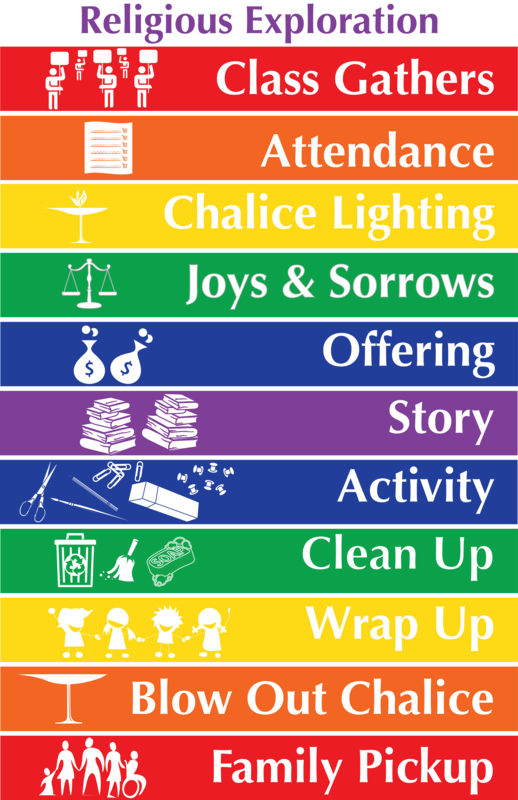 My intent was to create something that helped to remind everyone in the class what the order of the day should be and to do it in such a way that allowed those who couldn’t read to be able to follow the schedule easily. So far the posters have been warmly received. They are too new to know if this will help for the long haul, but I suspect they will. With an ever-changing volunteer corps and learners whose attendance rotates in unpredictable patterns, everything we can to help those in the classrooms know what to expect is bound to be helpful. This poster I created is available to any and all who would like to use it. This work is licensed under a Creative Commons Attribution-NonCommercial-ShareAlike 3.0 Unported License. This means that you are welcome to use it as is, make changes to it and reproduce it but can not put the original or any derivation up for sale. This was created for the common good of all Unitarian Universalist Religious Education communities. ← Verdict Part 2 – Is social media driving new expectations for congregations? Cool! We’ve never included an offering in RE classes, is this used for a specific RE purpose or and RE Faith In Action cause? Or does it go to general Stewardship of the church? My Lead and I love this… but… Is there a way to edit out the “Offering” portion? Our UU church does not include that in the Children’s RE model. It would seem to be more appropriate for Adult RE, or best left in the Sanctuary during service. I don’t have a version that is edit ready. Would be nice to have that option. Hmmm…..